NIGHT BITE ON NORFORK LAKE: Norfork Lake's spring fishing season is starting to heat up. After many weeks of not being out on the lake I am finally back at it. 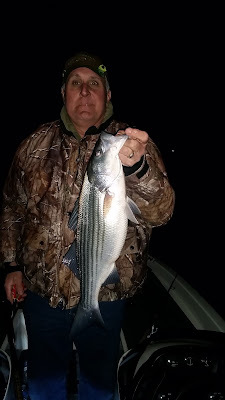 I fished the last two nights with John, a friend/guest of ours. 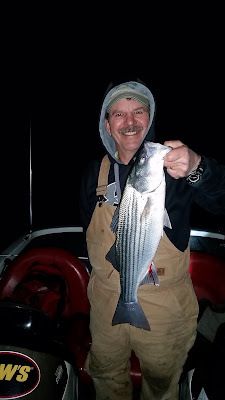 We were slow-rolling a suspending stick bait for striped bass. The bite after dark has started. The first day we had seven fish hooked and landed five and the second night we also had seven fish on and landed four. The largest fish was 10 to 11 pounds. 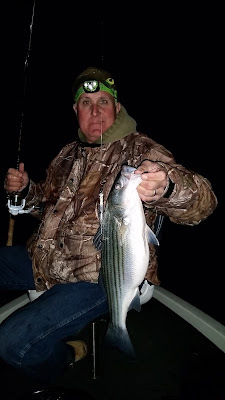 We fished from about 7PM until 9PM each night. For me it is the battle that is exciting, no matter what the size of the fish. All of our fish were released on site. If you have interest in fishing for striped bass after dark, here are good methods to use over the next couple of months. I use a shallow running suspending stick bait, 4 - 6 inches in length, such as a Smithwick Rogue or a Spro Mc Stick. (There are many other brands) There are two different ways to position your boat. Both are professed to be the best depending who you talk with. You can get your boat next to the shore line and cast parallel to the shoreline. This method keeps your bait in part of the strike zone at all times. The placement that I prefer to use is to get as far away from the shore as I can and still be able to cast within a foot or two of the shoreline. There is also a couple different methods of retrieval. Some like to jerk the bait 2 or 3 times to get the bait down 2 - 4 feet under the surface then retrieve to the boat very slowly. I prefer to cast to the shoreline, let the bait sit for 15 to 20 seconds, then start a steady retrieval back to the boat as slow as I can. If you think you are reeling slow, reel slower. The second method keeps the bait on the surface making a tiny wake. The first method has the bait submerged several feet down. Remember to always reel slowly all the way back to the boat, as I have had many strikes right at the boat when I am taking the bait out of the water. I have several favorite spots to fish after dark for stripers. 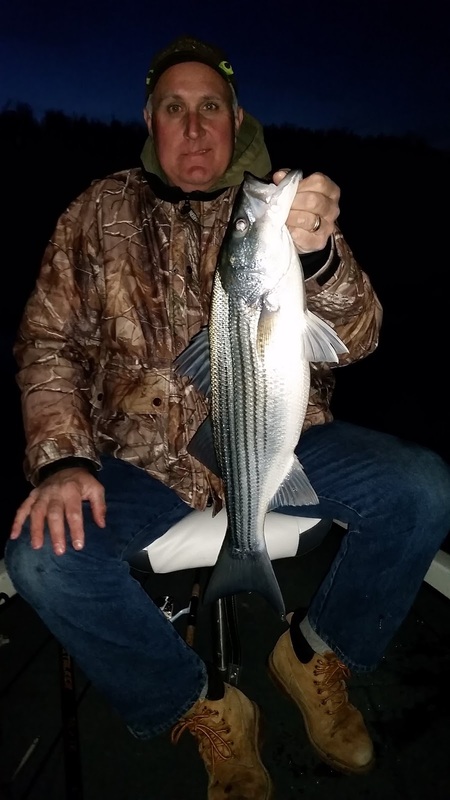 In general the stripers typically relate to long shallow water points. Cranfield area is a favorite spot, as well as in the major creeks in the area such as Panther, Fall and Float. I have been known to head back towards the 6A marker area and sometimes go even farther back. As you can see, you can try almost anywhere on the lake, if you don't see bait and fish on your point head to the next one. I have many second hand fishing reports on bass and crappie fishing, but at this time no first hand knowledge. I will be updating on these species in my next report. Norfork Lake has been stable and has been basically at normal pool of 553.68 for the last week or so with sporadic power generation. The surface water temperature is around 49 - 52 degrees. The main lake is cooler than the creeks. The water is stained, both the main lake as well as the creeks. The lake is starting to clear, but still will take some time.